'Twas on a bleak Tuesday (-ish) in 1698 that Padua resident Bartolomeo Cristofori dropped a hammer on his foot. Seeing it bounce, he was struck not only by said hammer, but with the urge to beat the daylights out of his harpsichord’s innards. And so were born the piano and about a billion crap ballads. Cristofori had figured that hitting stuff was a good way of making it vibrate and set about building precursors to the modern balladeer's ludicrously over-engineered accessory that we recognise as the concert grand. Cavemen hit on the hitting-stuff ruse several thousand years earlier when stretching skins over hollow logs. 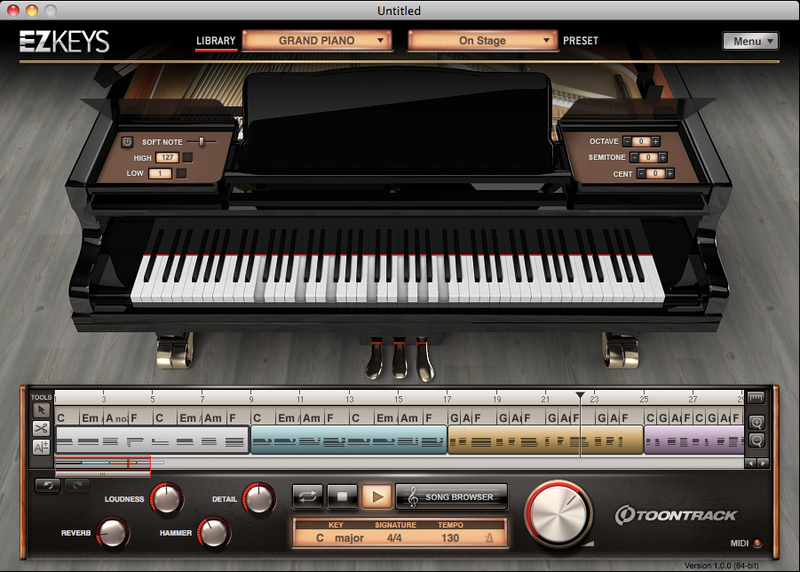 However, it took until 2006 for another musical pioneer, Swedish software developer Toontrack, to devise a high-tech means of easily creating percussive grooves with EZdrummer, which encouraged numerous muzos to ditch their wetware percussionists. The advantage of this has been to encourage levels of remorse and self loathing sufficient to inspire new, even drippier ballads as piano-equipped songsmiths wallow in separation anxiety concerning absent drummers. Last year we saw the introduction of EZmix, a means by which audio engineers and producers can also be fired as deployment of sophisticated signal-processing passes to the hands of the songwriter. And now it’s the turn of the keyboard player, and even the songwriting partner, to be dumped with today’s launch of Toontrack EZkeys Grand Piano, another percussion suite featuring not sampled skins, but tensioned strings. However, it’s rather more than just another virtual Steinway. Get the picture? The MIDI library, accessible via a Song Browser, covers basic chords, pop & rock, soul/RnB, country, gospel, jazz, Latin, funk, blues and boogie, as well as incorporating a modicum of woogie along with a handful of whizzy effects and endings. The genres are divided up into straight (4/4) and some swing (6/8) variations, then into such song parts as intro, verse and chorus, on each of which there are variations. 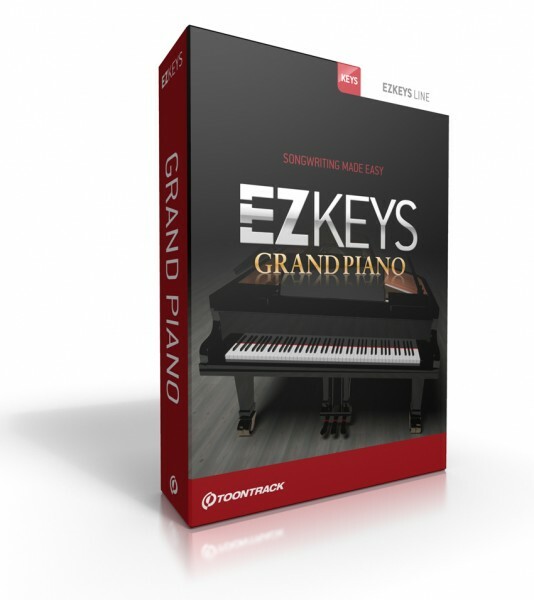 EZkeys is more than a piano-based, semi-auto-accompaniment device; it’s a MIDI chord analyser, compositional power tool and excellent music theory tutor all rolled into one. As you’d expect, we’ve the means to adjust tuning in octaves, semitones and cents, as well as fine-tune velocity sensitivity, the controls for which are sited at each side of a curiously empty music-rest graphic in instrument view. Maybe this is reserved for displaying yet more data in a future update. To these ears, and despite ‘sympathetic resonance’ sample technology, the Standard piano preset isn’t spectacular. But then, these ears have been spoiled somewhat by auditioning a good many dedicated sample-based and physically modelled piano products that do not feature EZkeys’ compositional and educational tools. Sensibly, nay bravely, Toontrack has included a setting called Raw Tweaks, which gives access to the raw samples captured during the studio sessions. They’re naked takes ready for you to apply whatever sparkle is available from the tools in your current DAW setup. A most commendable inclusion, as is the means to be able to save custom effects settings as User Presets. It’s EZ to see where this title is headed - just take a look at what’s happened to EZdrummer since launch. MIDI file export to DAW and MIDI import with chord analysis are excellent facilities which will doubtless be built on by expansion packs offering yet more accompaniment phrases in more genres. 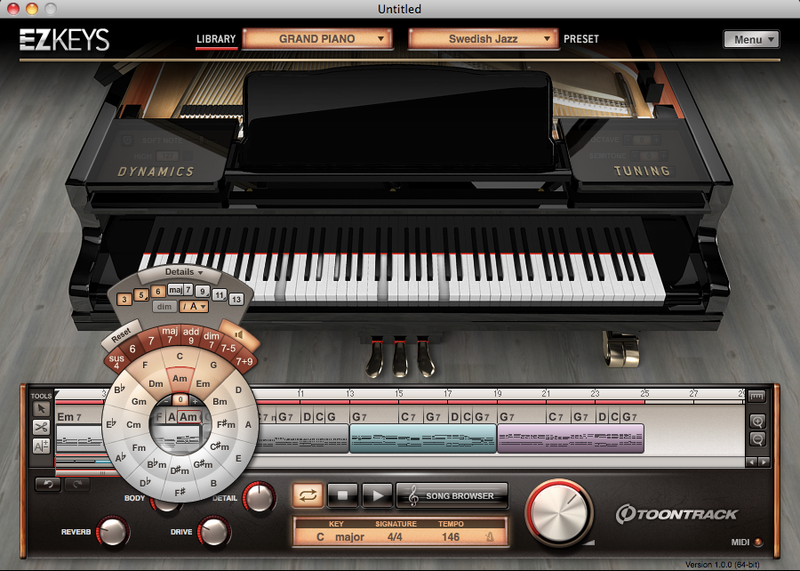 I look forward to seeing other instruments, such as harpsichord, clavinet and organ, being made available as sound banks, along with more effects chains, but what would really swing it for me are signature refills, as Toontrack has made available for EZdrummer, Superior Drummer and EZmix. Imagine having name pianists lending their own voices to your songwriting endeavours. 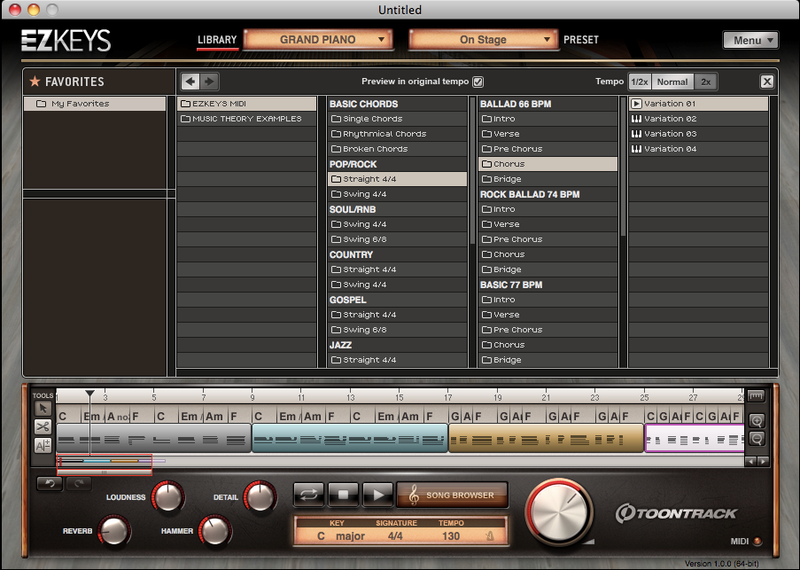 A soundbank and MIDI chops credited to Keith Emerson would top up my studio tan to the pallor of undead goth. The same goes for a Rick Wakeman pack, but then I’m not ashamed of my prog heritage. Honest. However, there are plenty of other players, including a good many dead ones, whose phrasing would be good to have on tap when ladling out hit compositions. For now, this £115 download or boxed offering from UK distributor Time+Space, or direct from Toontrack, provides an affordable hosepipe to a songwriter’s reservoir and bucketfuls of tutorial potential for the academically arid. I doubt EZkeys would adequately replace an inspired writing partner, or the exotic materials of a real Steinway, but it’ll certainly open up avenues in your development as a songsmith.